Today I am going to share Probability shortcuts for problems based on Dice. Must Probability trick: When 2 Dices rolled together. If 1 appears on the first dice, 1 on the second dice and 1 on the third dice. If 6 appears on the first dice, 6 on the second dice and 6 on the third dice. The sum could be 3, 4, 5, 7, 8, 9, 10, 11, 12, 13, 14, 15, 16, 17, and 18. What is the probability of getting a sum of 4 if three dices are rolled together. What is the probability of getting a sum of 5 if you throw three dices together? Now as you can see that it is a time consuming method, let us find a quick method to find the probability. 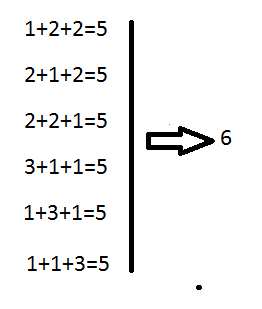 There are total 16 numbers (possible number of sums) and half of 16 is 8. Counting 8 from both the sides we get 10 and 11 in the middle. Now we will construct the triangle which would help us to find the probability if three dices are rolled together. What is the probability of getting a sum of 11 if three dices are rolled together? 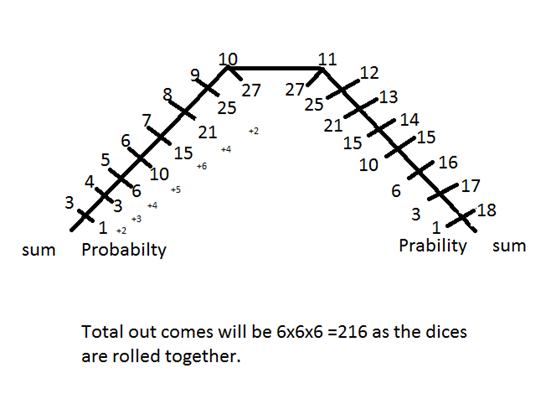 What is the probability of getting a sum of 14 if three dices are rolled together? What is the probability of getting a sum of 11 or 9 if three dices are rolled together? If 3 dices are rolled at the same time. What is the probability of all 3 dice showing even face values? There are 3 ways 2 can appear on in first go. Similarly, there are 3 ways 4 can appear on in first go. There are 3 ways 6 can appear on in first go. What is the probability of not getting 6 when 3 dice are rolled together? 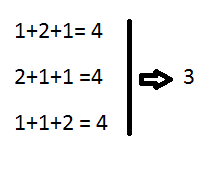 Remember AND means multiply and OR means ADD. 14th ka ans 1881 hoga na?? If 3 dices are rolled at the same time. What is the probability of all 3 dice showing even face values? - Sir, shouldn't the number of favourable cases be 3*3*3=27? I am btech in civil engg...is this create any problem at the time of interview of bank po or bank clerk? Sir I m facing difficulty in probability on cards questions.. Can u plzz help in this matter?